Eating healthy, raw, whole, clean foods help your body to feel lighter, more energized and all around more healthy. It works to rebuild healthy digestion, energy production, metabolism and weight management. When we enjoy raw, whole foods the way nature intended, we inject health-promoting vitamins, enzymes fiber, healthy carbs and fats, antioxidants and phytonutrients. Phytonutrients are of particular interest because they are the compounds and chemicals that help plants defend against environmental challenges such as damage from pests or ultraviolet light and appear to provide protection for humans as well. There’s no better way to get these health promoting goodies into our body than to enjoy a healthy green smoothie. The intense nutrition provided by these drinkable ‘power-houses’ help prevent disease and weight gain but also work to slow the aging process and increase vitality and boost our energy…the very things we need to live our lives to the fullest. So, what is it that distinguishes a ‘green smoothie’ as a green smoothie? 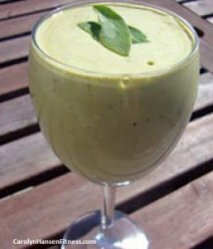 It is a combination of healthy green leafy vegetables blended with a fruit smoothie. In other words…tender greens combined with fruit and water. The varieties are endless as you can use any greens and fruit choices you prefer. Let’s face it, greens are extremely nutritious but unfortunately for most of us they are hard to fit into our daily diets. Truth is, disease loves an acidic environment green smoothies are very alkalizing on the body. The more alkalizing foods you eat the better. They are full of vitamins and minerals and good types of carbohydrates. They are also full of chlorophyll straight from the sun which boosts your nutrition for optimum health and well-being. The human body is truly a ‘wonder’ and if you give it the right fuel it knows how to heal itself. Drinking a glass or two daily adds important nutrients to your daily diet. You can use green smoothies as meal replacements (obviously not all of them you still need to eat other ‘real’ foods) or simply add it to your present diet. Step 1: Add liquid. It’s near impossible for most low-end blenders to make a smoothie without some added water. Not adding enough water liquid might make the smoothie too thick. You can use coconut water, water or home-squeezed fruit juices. Step 2: Pick your base fruit. These give your smoothies a creamy texture. These include banana, mango, peach, pear, apple, papaya and durian. You can also use frozen fruits to add thickness and coldness to your smoothie. Step 3: Combine flavors. No set rule her…just use your taste buds as guides and don’t be afraid to be a bit whimsical with your blender. You can also add flavoring like vanilla bean, clove, cinnamon and some people even enjoy cayenne pepper when enjoying chocolaty smoothies made with raw cacao. Step 4: Add your greens. Even if you do not like the taste of greens like spinach don’t be afraid of them in your smoothie. All that yummy fruit works to disguise the flavors…you’ll never know they are there but you’ll get all the nutrition (same goes with your family)! Baby greens like spinach, kale, parsley, chard and other organic leafy greens work well. A good ratio is 40% greens to 60% fruits in each smoothie. Step 5: Blend it up. Hit your pulse button a few times to mix the greens before hitting the preset smoothie button. Once your smoothie turns bright or dark green and it’s smooth as silk it’s ready to drink. Don’t wait another day to give your body the health advantages contained in your super-green smoothie. Once you feel the boost in energy you’ll be hooked.